Rome (VNA) – The Hanoi University (HANU) and Italy’s Niccolo Cusano University (UniCusano) will enhance student exchanges as part of an agreement reached recently. Representatives of the two universities had a working session at UniCusano’s headquarters in Rome on July 26. UniCusano President Stefano Bernacchi expressed the willingness to boost cooperation with Vietnamese universities, especially HANU – the first and biggest school to provide Italian language undergraduate courses in Vietnam. UniCusano is ready to give the best possible conditions to Vietnamese students, he noted, adding that it will grant 10 full scholarships for eligible students to follow undergraduate courses at the Italian school. 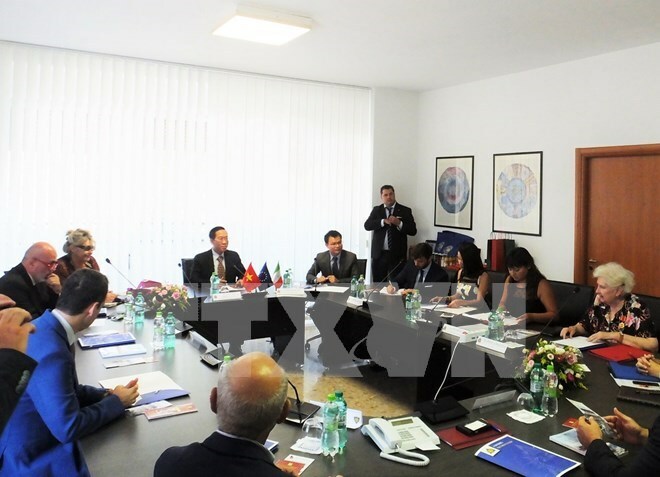 At the session, Trade Counsellor Bui Vuong Anh at the Vietnamese Embassy to Italy highlighted cooperation potential between the two countries’ universities and businesses. He stressed that the embassy is willing to bridge UniCusano with Vietnamese universities and help it seek business opportunities in the Southeast Asian nation. Tran Thanh Quyet, Dean of HANU’s Italian language faculty, said his school has cooperated with two Italian universities in lecturer and student exchange and dual degree programmes. It is ready to work with UniCusano in research projects in Vietnam. His Italian language faculty will soon select eligible students for UniCusano’s scholarships while designing curricula and sending lecturers for upcoming Vietnamese language courses at the university, he added. HANU and UniCusano are expected to ink a cooperation agreement on lecturer and student exchanges in the near future. Accordingly, UniCusano will work with the Vietnamese side to offer Vietnamese language courses for Italian students, entrepreneurs and others interested in.